While the link between circadian clock disruption and cancer has been established in animal models, the new study provides the first direct confirmation of such dysregulation in human tumors. Jacob Hughey, PhD, and colleagues have created a method to infer the “ticking” of the circadian clock using gene expression data from human tissue samples that lack time of day information. Here they use the new method to characterize circadian clock progression in a range of human cancer types. 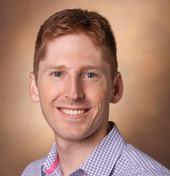 “We find that the normal daily rhythm that we have in almost every cell in our body is strongly perturbed in tumor tissues,” said Hughey, assistant professor of Biomedical Informatics. Long-term disruption of circadian rhythms, such as that posed by night shift work, increases risk for certain types of cancer. And recently researchers at the Salk Institute for Biological Studies have shown that, in mice and in human cells in vitro, drugs that activate the circadian clock kill cancer cells without posing toxicity. “If that finding were to be borne out in clinical testing, our study would suggest restoring normal clock progression could be a broadly applicable anti-tumor strategy, because we’ve found dysregulation of the circadian clock across the gamut of cancer types,” Hughey said. Psychiatric disorders would be among the many opportunities for further study using the new method, he said. Cells in organs throughout the body exhibit a daily cycle, or circadian rhythm, evidenced in patterns of gene expression, that is, how strongly various genes are turned on or off. A large amount of gene expression data from human tissues is publically available, but nearly all of it has no information about the time of day at which the tissues were acquired. “The question we’ve asked is can you say anything about the clock anyway, can you make any use of those data even without the time of day information. And cancer is a nice starting point because there’s a ton of data available and prior work suggests that circadian disruption and tumor development are intertwined,” Hughey said. He and colleagues turned to public, online gene expression data sets. They focused on 12 genes, shared by mice and humans, whose 24-hour rhythms in gene expression are a marker for circadian clock progression at the cellular level in multiple organs. “With circadian data from mice there are fewer confounding variables than in a human data set, plus we have data from a large number of mouse organs, whereas the availability of time-labeled data from human studies is comparatively limited,” Hughey said. With the mouse data sets as a prospective control, the researchers quantified the correlation in expression among the 12 genes in human data sets, including data sets from circadian studies with time of day information, and cancer patient data sets without time of day information, using both non-tumor and tumor tissue. Across human organs, the 12-gene circadian co-expression pattern in healthy/non-tumor tissue was more similar to the validated mouse control than was the co-expression pattern in tumor tissue. Statistical significance of the similarity in co-expression was assessed using randomly selected genes and permutation of non-tumor and tumor data. “Based on this study alone, we can’t say whether the tumor is breaking the clock or the clock broke and that allowed the tumor to grow. We can just say that clock-gene co-expression is significantly perturbed in tumor samples relative to non-tumor samples,” Hughey said. Joining Hughey in the study were undergraduate student Jarrod Shilts, now studying at Cambridge University as a Churchill Scholar, and, from the University of Wisconsin-Madison, Guanhua Chen, PhD. The study was supported by grants from the National Institutes of Health (GM124685, D023196, HG009086).